After painting on the third coat of JINsoon Auspicious, I felt the kind of excitement – the kind that makes you want to jump out of your bed and whoop for joy like Charlie Bucket's grandfather – that's become increasingly rare with every new beauty product I acquire. At first glance, Auspicious is but a light milky gray, but stare at it a little longer and you start to see the lavender peek through, then you realize it's the perfect in-betweener. It's Addiction Concrete Jungle (one of my absolute favorite eye shadows) in polish form. The formula for this particular color is thinner compared to the other JINsoon creations I've tried (Rhapsody and Risque, which will appear on the blog in due time), but based on how the color looks by layer, I think that was intended. I applied the polish in thin strokes, thus required three coats to reach complete opacity. It was fast drying, and hasn't chipped after a rigorous round of dishwashing and dinner making. In my book, it's a complete win. 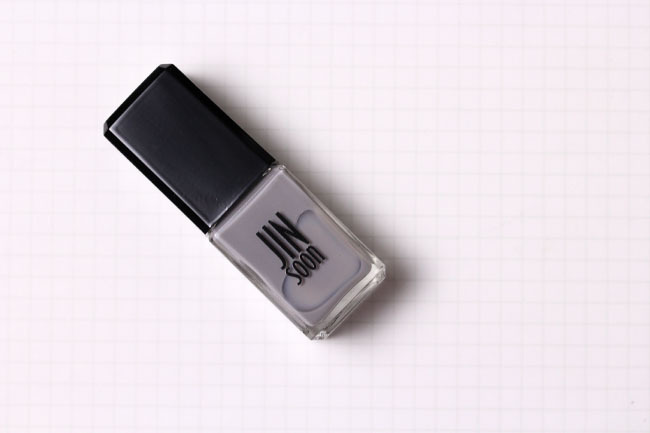 JINsoon Auspicious Nail Lacquer retails for $18 and is available at Sephora and Space NK, as well as JINsoon nail salons. If you're interested in purchasing, I consider it my duty to inform you that the Sephora Friends & Family Sale will commence in two days, so hold on to those pursestrings just a little longer! Love how your skin looks in this post! Thanks for the heads up on the Sephora F&F sale; I had been wondering when it would come around. I like the lower face/hand shoots! Ever since I read about JINsoon in a magazine, I've had my eye on the line. This is such a beautiful color! I adore the subtle hint of lavender~ It makes the colour so interesting and unique.